Travel on Stagecoach West buses is about to get a whole lot easier – and cheaper -in Gloucester. The New Year brings new travel options for passengers of Stagecoach West in the city including ticket simplification plans rolled out across the Dayrider zone. Users of the free Stagecoach bus app already get access to cheaper tickets, but the new initiative means customers can enjoy a range of savings. The most significant being for groups of any four people when travelling together, as well as passengers under 19 years of age. Previously a young person’s ticket was valid until their 17th birthday, but now commuters, college goers and passengers under the age of 19 can take advantage of cheaper day, week and month-long travel. Tickets are even now valid for travel before 9.30am daily. Travellers up to the age of 19 can also enjoy savings up to £3.50 on their weekly tickets and £14 on a 28-day ticket. In addition, any four passengers of any age who travel together, can save a huge £7.50 when they purchase a group day ticket via the app. That works out as just £1.88 per person - much cheaper than a taxi to go shopping in the Quays or to get into town for a night out. “We’ve begun 2019 hoping to simplify the ticketing system for our passengers. 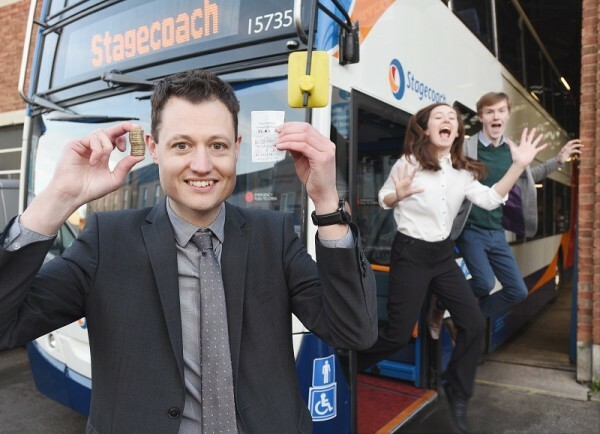 Ultimately, we want to make it easier for people to travel,” said Rupert Cox, managing director of Stagecoach West.